You’ve Got One Chance To Make Sure Everything Is Prepared… Are You Prepared? While on your trip you have the most amazing time, you meet incredible people, everything you planned works out perfectly, your money and gear last the whole trip – it’s pure enjoyment and nothing goes wrong. While on your trip you think you have everything planned, enough money saved, the right gear etc. Half-way through the trip you realize that isn’t the case and you’re forced to learn the hard way about how RTW traveling really works, resulting in extra unnecessary stress and uncertainty. What if you could have two experienced travelers coaching you step-by-step on every aspect of how to prepare for and get the best out of your trip? The Pre – Travel Guide is an eBook designed to give you the best step-by-step advice so you can prepare every area of your next trip with stress-free confidence and without worrying that you missed any important details. This Travel Guide book gives you the INSIDER TIPS – it’s about cutting the fat, and giving you exactly what you NEED to know, not just a bunch of re-hashed info which might help to get you started – this book is the complete Pre – Travel Guide. And the best part? it’s a downloadable Travel Guide eBook which you can have today (with no extra delivery or shipping fees!) – for only $4.95 US. I’m a big researcher – I’ve read several pre-travel guides over the past year. Thanks to Nathan and Sofia’s thoroughness and unique outlook, I can say this is definitely the best one I’ve read. As We Travel – E-Book Review via Backpack With Brock. The Pre: Travel Guide: What’s Inside? 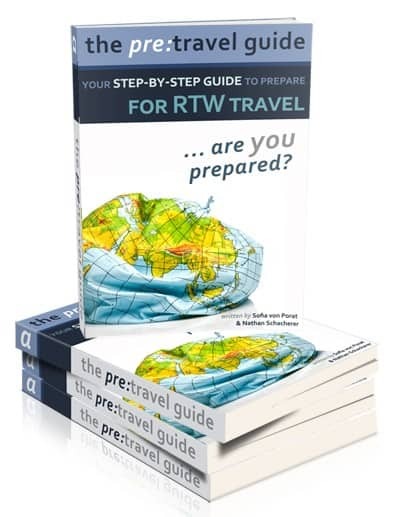 The Pre – Travel Guide is a downloadable PDF eBook specifically designed to help you improve every part of your RTW preparation – from planning, saving, where to go, cheap transport, staying healthy, dealing with scams etc. Because it’s about taking action – Read this book, and you WILL travel – simple. Instead of sitting around travel-dreaming, this book inspires you to get out there and see the world the best way possible – stress-free! Because you get FREE eBook updates for life – Yup, we are always looking for better and better ways and ideas when it comes to traveling the world – so anytime we find something new we think you need to know about, we will update the book and you can download it again – FREE! From an Interview with Nathan & Sofia: This Travel Guide book is the result of our first backpacking trip around the world. For 8 months we traveled through Oceania, South East Asia and Europe. With no preparation whatsoever, and only $6,000 US each, we left home, driven purely by a sense of adventure. During those 8 months that followed we made pretty much every mistake you can think of. We had to learn how to travel the right way by doing it the hard and wrong way. There were so many times we just wanted to give up and go home, but instead we learned how to turn that stress, and uncertainty into a core driving force which left us after that first trip even more motivated, and excited to travel the world again and again and again. Our aim with this Travel Guide book is to help you to prepare for your trip the best way possible so you won’t have to deal with the same messed up situations and and do the stupid things we did. This Travel Guide book is meant to be something you can use as a step-by-step reference guide helping you understand the basics of trip planning, where to go, and what to take, all the way to how to deal with that first month on the road. This book is everything you need to get started. How to plan a round-the-world trip? Demo country routes with estimated living costs in Europe, South East Asia & Oceania. Staying in touch back home, internet, Wi-Fi etc. Nathan Schacherer and Sofia von Porat, a 20-something couple, have been traveling around the world together since 2008. They run the popular travel site AsWeTravel.com sharing weekly travel advice, city guides and videos with the mission to inspire, and provoke others to get out there and really enjoy the world. AsWeTravel.com has been featured as part of the LonelyPlanet Blogsherpa Program, ranked top 50 Best Travel Blog by Travelpod.com, and have had travel articles published on numerous other online travel-related media sites. Well written, nice layout, modern approach, filled with so many useful tips, facts and links – making this a good guide for both beginners and experienced travelers – aimed to bring the best out of our great travel adventures. If you are just getting out of college and ready to backpack through Europe and have never been outside the country, I think this book would be perfect for you – if you are new to the whole round the world trip or new to travel in general, this is a good place to start, providing the step by step guide that makes the process a little less daunting. This eBook is a good tool for any traveler who wish to have the whole “travel picture” in a single package, even experienced ones. It’s all about cutting the fat – giving you exactly what you need to know without wasting your time. It provides all the information “distilled”, not to mention all the Google hours it will save you. For me, that’s one of the biggest benefits of this eBook. If you’re not satisfied that The Pre: Travel Guide is helping you plan your next RTW trip within 30 days just let us know and we’ll refund your money in full. That’s how confident we are that this book is a resource that will help you improve every part of your RTW planning process, and also improve the quality of your trip once you are on the road. The Pre: Travel Guide is ready for your download right now for ONLY $4.95 US – to secure your copy simply click the ‘Buy Now’ button below – you’ll be taken to a page where you can make your payment via PayPal or Credit card and get immediate access to the book. How To Travel Around the World For Just a Few Thousand Dollars From 2 travelers who did it…and have countless tips to share. Now YOU can avoid the hard knocks and big mistakes the authors made in this very helpful world traveler’s tell all. Planning out on a trip and spending some time with family and friends is among the common goals of a lot of people today. They are after enjoying the most amazing time of their lives in meeting new and incredible people in a certain location. Travel Guide Finally Released is designed as an eBook guide on traveling around the world. This includes almost one-hundred pages of lessons and tips to interested people. The opportunity to get the best step-by-step advice to be prepared for the area of the next trip. Enjoyment of a stress-free and confident trip with your families and friends. The Opportunity to Learn More Tips and Suggestions from Sofia and Nathan. FREE eBook Updates About Life-Learn more about the better ideas and ways in traveling the world. It is updated and downloaded again for free. 100+ High-Resolution Travel Photos with every page containing real life and inspiring images across the countries. There is a perfect blend of pictures and text making this a perfect and inspiring travel book. Why Did We Write The Pre-Travel Guide? The Pre- Round The World Travel Guide is an eBook which includes over 100 pages full of lessons and tips we learned while traveling around the world on our first RTW trip. Back then, we both really had NO IDEA when it came to budget long-term travel, and during that first 8 month RTW trip with only $6,000 each we were forced to learn everything about travel the hard way. 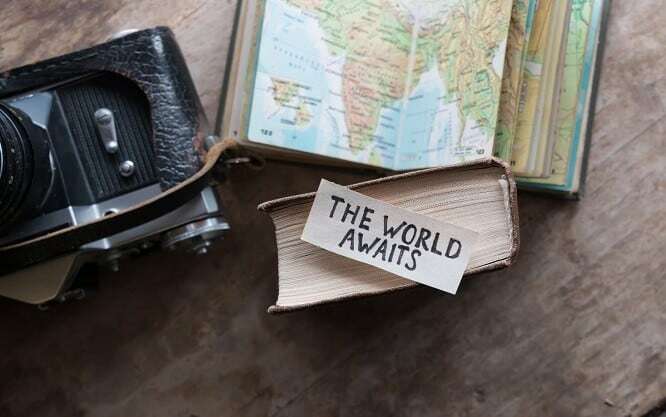 We hope that by releasing the The Pre-Travel Guide, we can be there for you and help you prepare for your next RTW trip the right way – without you having to experience the same uncertainty & stress as we did. We really look forward to hearing back what you think – so check out the book, read through it and send us an email with your feedback! plan a round-the-world trip – Imagine yourself visiting all the tourist attractions across the world in one go! Well, the very thought might seem to be a distant dream, but, believe it or not, there is a way to experience them for real. Doesn’t the idea itself give you goose bumps? Well, it can be exciting to visit all the interesting places in one go. But, as exciting as it may seem, a round-the-world trip can be really difficult and challenging. There is a long list of preparations to be done to make it successful and this requires adequate planning. What are your must-see destinations? Make a list of a few places. On the basis of it, take a map and connect and figure out the route that you would wish to take which will be most appropriate in terms of saving time and money. Accordingly, you can book different modes of transport by figuring out the starting point and the end point of your journey. Also, you will be able to divide your time properly if you are aware of the route you wish to take. A round-the-world trip can be done either in a span of 20 – 30 days extending to months or even a year or longer. Since you might have work commitments, you should plan for it well in advance to save your leaves and accrue more time. Perhaps you can apply for sabbatical or a leave of absence. The sooner you plan, the more you can find and take advantage of discounts on air travel and lodging and tours (should you choose to go this route). Avoid unnecessary stuff on this extended trip round the world. If possible, try to keep as minimum number of baggage as possible. This is because every country will present you with different conditions and you might be walking, going on road trips, visiting forests, etc. ; where handling multiple baggage will become quite difficult! Everything you bring should serve multiple purposes. There are certain items that may prove to be of significant use on the trip. You need to carry a flashlight, sunglasses, and medicines, etc. to remain safe and in contact with the rest of the world, even though you may be on one of the remotest places in the world! A good portable charger is a must to keep your phone in functioning so it’s available if you need it. Whichever country you land in, you need to research different hotels in advance of arriving to find a suitable accommodations. Not being familiar with your surroundings, you will need to plan for safe lodging. By pre-booking a hotel or guesthouse in advance for the first day of reaching a particular place and then extend your visit or find a better place afterward. This way, you will have a place to sleep on the first night. You can also avail discounts if offered at that time. If you wish, you can make a rough schedule of your trip and the places that you will visit on the respective dates. But, at the same time you need to be flexible. If some flight delay happens, you need to be prepared to skip a particular place or extend your stay in a particular country. Do not commit to any reservations except for few hotels during the first few days in the starting city. Also, have a suitable gap in your schedule to counter any unexpected situation. No matter how prepared you might be, you will be welcomed by a lot of unexpected challenges…so keep on top of your travel preparations. Be positive and prepared if the weather isn’t what you hoped for or if an attraction isn’t what you thought it would be. Remember, they all add up to the experience of your trip and the memories you are making. Be up-to-date with your prescriptions, vaccinations and medical procedures in advance of your trip. Depending on where you are traveling, have a plan to protect against mosquitoes and other serious issues. Before a RTW trip, you need to be prepared for any political or personal emergency that might require you to spend a lot of money which might go beyond your budget. How to plan a round-the-world trip isn’t difficult when you break it down well in advance of your departure. Plan ahead, and you will enjoy the trip of a lifetime. 100+ High-Resolution Travel Photos with every page containing real life and inspiring images across the countries. There is a perfect blend of pictures and text making this a perfect and inspiring travel book.